Akt is considered as an attractive target for anticancer drug discovery and development and therefore extensive efforts have been devoted to the discovery of new potent anticancer agents targeting Akt. Due to the importance of thiadiazoles for anticancer drug discovery, herein eight 1,3,4-thiadiazole derivatives were investigated for their cytotoxic effects on C6 rat glioma and A549 human lung adenocarcinoma cell lines using the MTT assay. The effects of the most promising anticancer agents on apoptosis, caspase-3 activation, mitochondrial membrane potential, and cell cycle arrest were determined on a BD FACSAria (I) flow cytometer. 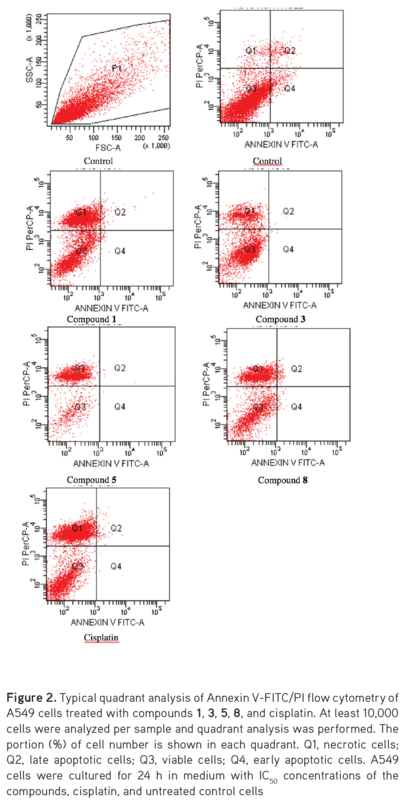 Akt activity was measured in the C6 and A549 cell lines using an ELISA colorimetric method. Schrödinger’s Maestro molecular modeling package was used to explore the possible binding modes of compounds 3 and 8 in the active site of Akt enzyme (PDB code: 3OW4). N-(4-Chlorophenyl)-2-[(5-((4-nitrophenyl)amino)-1,3,4-thiadiazol-2-yl)thio]acetamide (3) and N-(6-nitrobenzothiazol-2-yl)-2-[(5-((4- nitrophenyl)amino)-1,3,4-thiadiazol-2-yl)thio]acetamide (8) induced apoptosis and cell cycle arrest in the C6 cell line through inhibition of Akt activity (92.36% and 86.52%, respectively). The docking results of compounds 3 and 8 indicated that π-π interactions, H bonds, and salt-bridge formation were responsible for the observed Akt inhibitory activity. According to in vitro and docking studies, compounds 3 and 8 stand out as promising antiglioma agents. Prompted by the aforementioned findings, herein we focused on the in vitro antiproliferative effects of a series of 1,3,4-thiadiazoles on A549 human lung adenocarcinoma and C6 rat glioma cell lines. Further in vitro and in silico studies were also carried out to determine the mechanism of antitumor action of the most potent anticancer agents in this series. 5-(4-Nitrophenyl)amino-1,3,4-thiadiazole-2(3H)-thione was synthesized via the ring closure reaction of 4-(4-nitrophenyl)thiosemicarbazide with carbon disulfide in the presence of potassium hydroxide. Finally, the reaction of 5-(4-nitrophenyl)amino-1,3,4-thiadiazole-2(3H)-thione with N-(alkyl/aryl)-2-chloroacetamide/4-(chloroacetyl)morpholine in the presence of potassium carbonate afforded compounds 1-8. 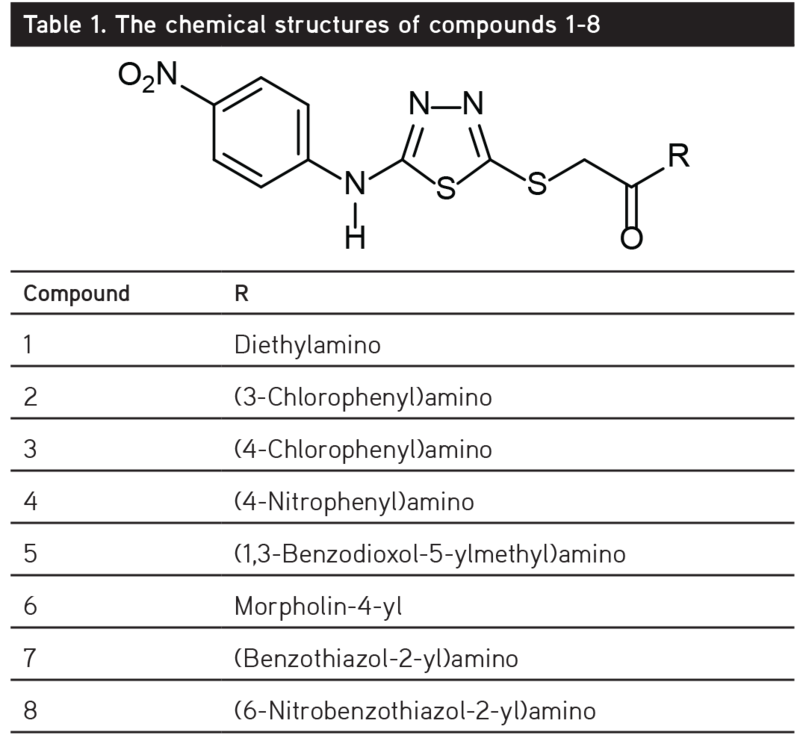 The synthetic procedure and the spectral data of compounds 1-8 were reported previously by our research group.23 The chemical structures of the test compounds are given in Table 1. C6 rat glioma and NIH/3T3 mouse embryonic fibroblast cells were incubated in Dulbecco’s Modified Eagle’s Medium (Sigma, Deisenhofen, Germany) supplemented with 10% fetal calf serum (Gibco, Paisley, Scotland). A549 human lung adenocarcinoma cells were incubated in 90% RPMI supplemented with 10% fetal bovine serum (Gibco, Paisley, Scotland). All media were supplemented with 100 IU/mL penicillin-streptomycin (Gibco, Paisley, Scotland) and the cells were incubated at 37°C in a humidified atmosphere of 95% air and 5% CO2. Exponentially growing cells were plated at 2×104 cells/mL into 96-well microtiter tissue culture plates (Nunc, Denmark) and incubated for 24 h before the addition of the drugs (the optimum cell number for cytotoxicity assays was determined in preliminary experiments). The stock solutions of the compounds were prepared in dimethyl sulfoxide (DMSO; Sigma Aldrich, Poole, UK) and further dilutions were made with fresh culture medium (the concentration of DMSO in the final culture medium was <0.1%, which had no effect on cell viability). The level of cellular 3-(4,5-dimethylthiazol-2-yl)-2,5-diphenyltetrazolium bromide (MTT) (Sigma) reduction was quantified as previously described in the literature24,25 with small modifications.26 Compounds 1-8 were investigated for their anticancer activity against A549 human lung adenocarcinoma and C6 rat glioma cell lines. NIH/3T3 mouse embryonic fibroblast cells were used to evaluate the selectivity of the compounds. After 24 h of preincubation, compounds 1-8 and cisplatin (positive control) were added to give a final concentration in the range 3.9-500 µg/mL and the cells were incubated for 24 h. This concentration range was chosen based on our previous studies.26 At the end of this period, MTT was added to a final concentration of 0.5 mg/mL and the cells were incubated for 4 h at 37°C. After the medium was removed, the formazan crystals formed by MTT metabolism were solubilized by addition of 200 µL of DMSO to each well and absorbance was read at 540 nm with a microtiter plate spectrophotometer (Bio-Tek plate reader, Winooski, VT, USA). Every concentration was repeated in three wells. The half maximal inhibitory concentration (IC50) values were defined as the drug concentrations that reduced absorbance to 50% of control values. After C6 cells were incubated with compounds 1, 2, 3, 4, 5, 8, and cisplatin at IC50 concentrations for 24 h, the caspase-3 activity measurement protocol was applied according to the manufacturer’s instructions (BD Pharmingen, San Jose, CA, USA). In brief, the cells were washed with cold PBS 1X cells and incubated with 0.5 mL of perm lyse solution for 30 min at RT in the dark. The pellets were washed twice with 0.5 mL of perm wash buffer. The cells were resuspended in 100 µL of perm wash buffer and 10 µL of caspase-3 antibody was added over 20 min at RT in the dark. 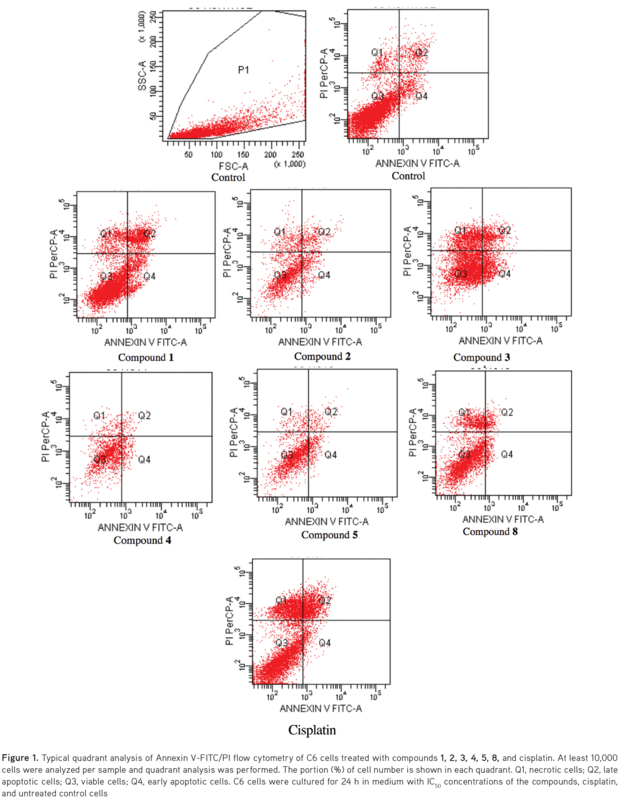 At least 10,000 cells were counted for each sample and the cells were analyzed by BD FACSAria flow cytometry using BD FACSDiva software version 6.1.1 (BD Biosciences, San Jose, CA, USA). After 10,000 cells/well were incubated with compounds 1, 2, 3, 4, 5, 8, and cisplatin at IC50 concentrations for 24 h, the in-cell ELISA colorimetric Akt activity protocol was applied according to the manufacturer’s instructions (Thermo Fisher Scientific, Rockford, IL, USA). Briefly, the medium was removed and 100 µL of 4% formaldehyde was added to each well. The plate was incubated in a fume hood at RT for 15 min. Formaldehyde was removed and the plate was washed twice with 100 µL/well of 1X TBS. The 1X TBS was removed and 100 µL/well of 1X permeabilization buffer was added, followed by incubation for 15 min at RT. Permeabilization buffer was removed and the plate was washed once with 100 µL/well of 1X TBS. The 1X TBS was removed and 100 µL/well quenching solution was added, followed by incubation at RT for 20 min. The quenching solution was removed and the plate was washed once with 100 µL/well of 1X TBS. The 1X TBS was removed and 100 µL/well of blocking buffer was added, followed by incubation at RT for 30 min. After the blocking buffer was removed, 50 µL/well of primary antibody was added. A plate sealer was applied and incubation was conducted overnight at 4°C. The primary antibody solution was removed and the plate was washed three times with 100 µL/well of 1X wash buffer. After the wash buffer was removed, 100 µL/well of diluted horseradish peroxidase conjugate was added, followed by incubation for 30 min at RT. The wash buffer was removed and 100 µL/well of 3,3′,5,5′-tetramethylbenzidine substrate was added. Then the plate was incubated at RT, protected from light. Next, 100 µL/well of 3,3′,5,5′-tetramethylbenzidine stop solution was added and the absorbance was measured at 450 nm within 30 min of stopping the reaction. The experiment was performed in triplicate wells. The values of blank wells were subtracted from each well of treated and control cells. Percent Akt activity was defined as the relative absorbance of treated versus untreated control cells. Statistical Package for the Social Sciences (SPSS) (Chicago, IL, USA) for Windows 15.0 was used for statistical analysis. The data were expressed as mean ± standard deviation. Comparisons were performed by one-way analysis of variance for normally distributed continuous variables and post-hoc analyses of group differences were expressed by the Tukey test. Probability values less than 0.05 (p<0.05) were regarded as significant. The MTT assay was carried out to determine the anticancer effects of the compounds on A549 human lung adenocarcinoma and C6 rat glioma cell lines (Table 2). 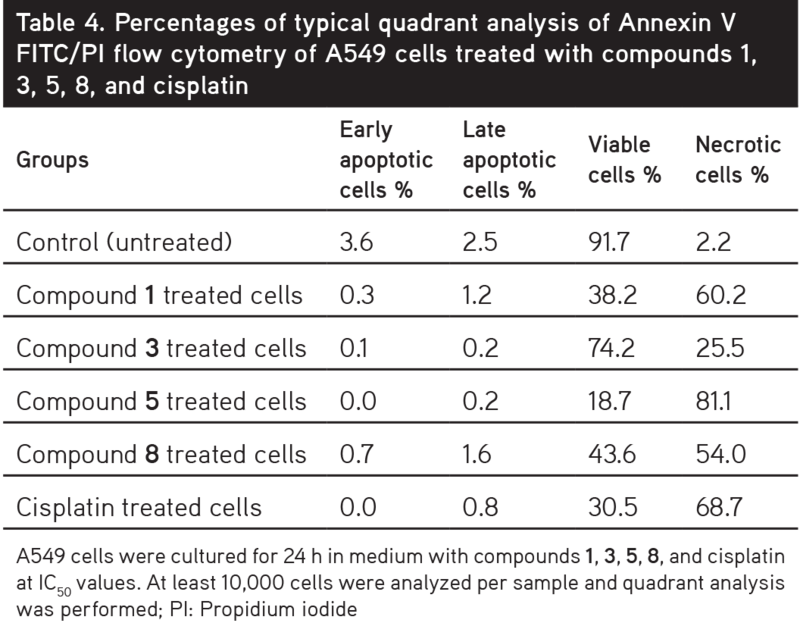 Compounds 3 and 4 were more effective on the C6 cell line than cisplatin (IC50= 24.33±0.58 µg/mL). 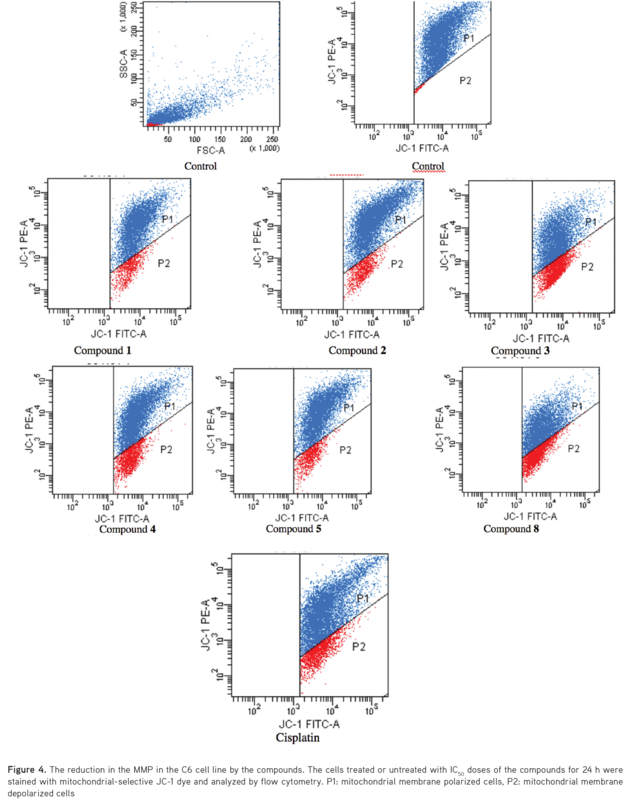 Compounds 3 and 4 showed antiproliferative effects on the C6 cell line with IC50 values of 22.00±3.00 µg/mL and 18.50±4.95 µg/mL, respectively. This outcome clearly indicated that p-chloro and p-nitro substituents significantly enhanced anticancer activity against the C6 cell line. Compounds 1, 2, 5, and 8 exhibited notable cytotoxic activity against the C6 cell line with IC50 values of 50.66±12.50, 42.33±2.52, 46.67±2.89, and 42.67±2.08 µg/mL, respectively. These results showed the importance of the alkyl and aryl groups attached to the acetamido moiety for anticancer activity against C6 cells. Compound 3 was found to be the most promising anticancer agent against the A549 cell line with an IC50 value of 21.00±1.15 µg/mL when compared with cisplatin (IC50=13.50±2.12 µg/mL). Compounds 1, 5, and 8 also showed anticancer activity against the A549 cell line with IC50 values of 46.33±2.31, 42.67±2.52, and 41.33±1.15 µg/mL, respectively. Interestingly, compound 4, the most potent anticancer agent against the C6 cell line, did not show any inhibitory activity against the A549 cell line (IC50>500 µg/mL). This outcome indicated that p-nitro substituent significantly decreased anticancer activity against the A549 cell line. Toxicity to host cells is an important characteristic to assess the safety of drug candidates early in the drug discovery process. In order to evaluate whether the compounds were toxic or nontoxic to healthy cells, the cytotoxic effects of compounds 1-8 on NIH/3T3 mouse embryonic fibroblast cells were investigated using the MTT assay (Table 2). Generally, the most potent anticancer agents in this series showed low cytotoxicity against the NIH/3T3 cell line with IC50 values higher than their effective IC50 values. 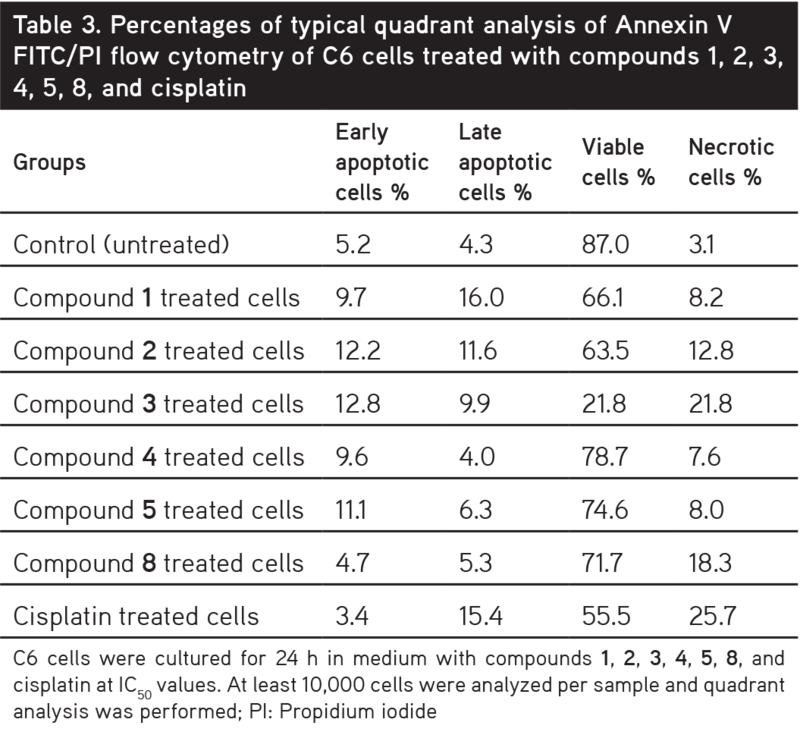 After the 24 h incubation period, the apoptotic effects of compounds 1, 2, 3, 4, 5, and 8 were analyzed based on Annexin V-PI binding capacities in flow cytometry. 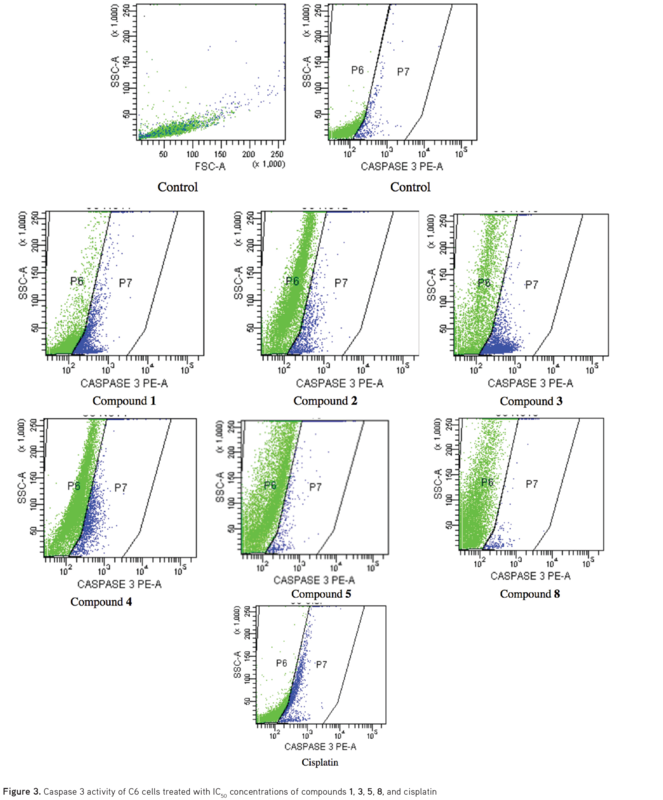 Following flow cytometric analyses, the early and late apoptotic effects of compounds 1, 2, 3, 4, 5, and 8 (for IC50 doses) on the C6 cell line were determined as 25.7%, 23.8%, 22.7%, 13.6%, 17.4%, and 10.0%, respectively (Table 3, Figure 1). On the other hand, the early and late apoptotic effects of compounds 1, 3, 5, and 8 (for IC50 doses) on the A549 cell line were very low (1.5%, 0.3%, 0.2%, and 2.3%, respectively). However, their necrotic cell percentages were very high (60.2%, 25.5%, 81.1%, and 54.0%, respectively) (Table 4, Figure 2). According to these findings, compounds 1, 2, and 3 (25.7%, 23.8%, and 22.7%) showed more apoptotic activity than cisplatin (18.8%) against C6 cells. On the other hand, compounds 1, 3, 5, and 8 caused necrotic cell death in A549 cells. Due to the key role of caspase-3 activation in the initiation of cellular events during the early apoptotic process,29 the effects of compounds 1, 2, 3, 4, 5, and 8 on caspase-3 activation in the C6 cell line were determined. 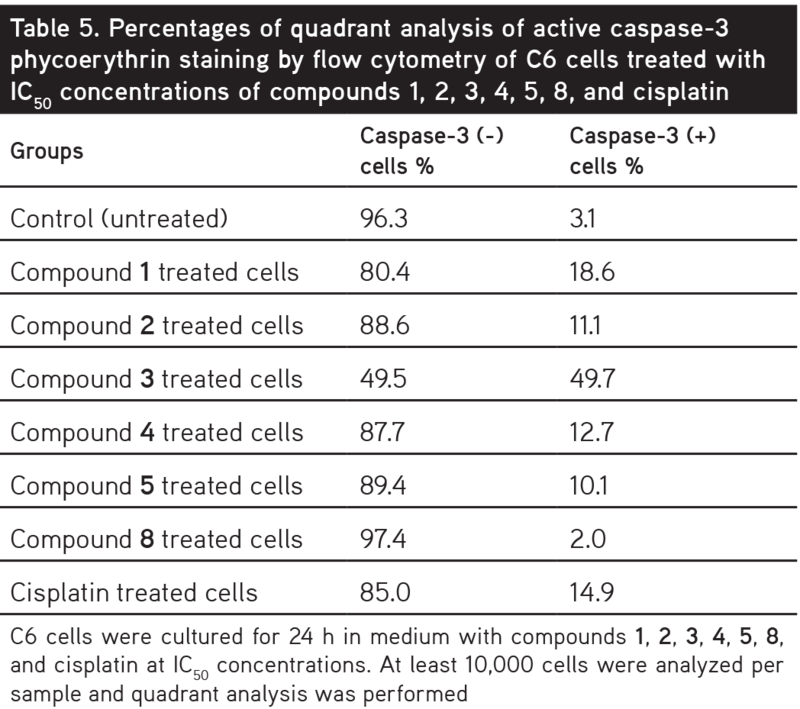 Caspase-3 positive cell percentages of compounds 1, 3, and cisplatin (for IC50 doses) were determined as 18.6%, 49.7%, and 14.9%, respectively (Table 5, Figure 3). On the other hand, caspase-3 negative cell percentages of these compounds and cisplatin (for IC50 doses) were determined as 80.4%, 49.5%, and 85.0%, respectively. These findings indicated that compound 3 was the most effective compound on caspase-3 activation in the C6 cell line. In order to investigate the effects of compounds 1, 2, 3, 4, 5, and 8 on the MMP of C6 and A549 cells, the cells were incubated with IC50 concentrations of these compounds for 24 h. Compounds 3 and 8 caused higher disturbance to MMP than cisplatin in both cell line. 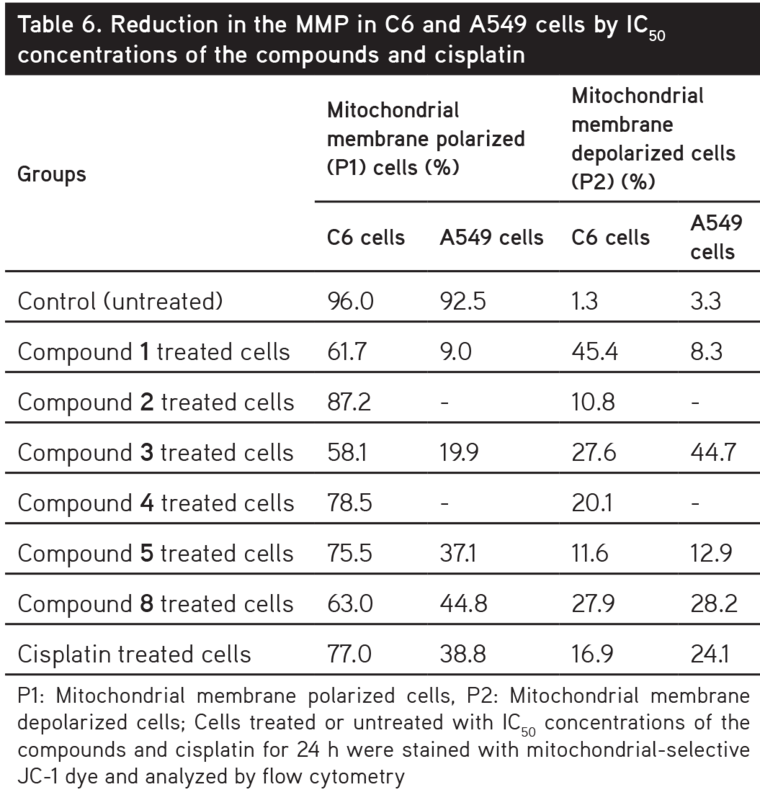 Mitochondrial membrane depolarized cell percentages of compounds 3, 8 and cisplatin (for IC50 doses) were determined as 27.6, 27.9, and 16.9 in the C6 cell line (Table 6, Figure 4), while mitochondrial membrane depolarized cell percentages of these compounds and cisplatin (for IC50 doses) were determined as 44.7, 28.2, and 24.1, respectively, in the A549 cell line (Table 6, Figure 5). 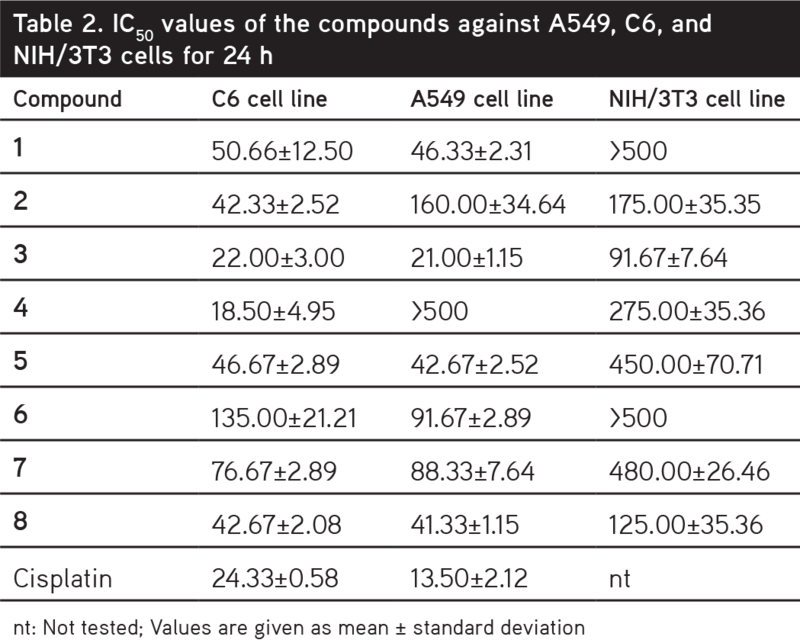 Due to the importance of cell cycle checkpoints for the progression of cell proliferation,30 the compounds were analyzed for their effects on the cell cycle in A549 and C6 cells (Table 7, Figure 6). Compounds 2, 3, 4, 5, and 8 induced G1/S phase arrest in C6 cells. Among them, compound 3 caused more G1/S phase arrest (67.21%) than cisplatin (62.57%). Compounds 1, 2, 3, 4, 5, and 8 arrested the G2/M cell cycle in C6 cells. 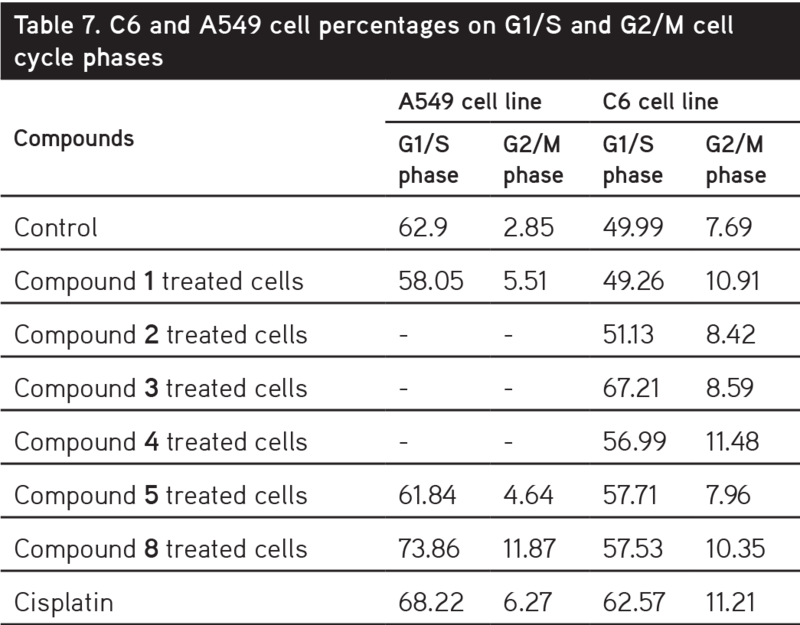 On the other hand, compounds 1, 5, and 8 caused G2/M cell cycle arrest in A549 cells (Table 7, Figure 7). Only compound 8 caused G1/S cell cycle phase arrest in A549 cells. The effects of compound 8 on G1/S arrest were more significant in A549 cells than in C6 cells. As a consequence of the pivotal role of Akt in regulating diverse cellular functions including cell growth, proliferation, and survival,1-6 the most potent anticancer agents were investigated for their inhibitory effects on Akt activity (Table 8). Compounds 3 (92.36±0.70% and 91.22±0.16% for C6 and A549 cells, respectively) and 8 (86.52±0.37% and 70.48±13.28% for C6 and A549 cells, respectively) were the most potent Akt inhibitors in this series compared to control cells (p<0.001). Molecular docking simulations were performed to elucidate the possible binding modes of compounds 3 and 8 in the active site of Akt enzyme (PDB code: 3OW4). The docking results of compounds 3 and 8 indicated that π-π interactions, H bonds, and salt-bridge formation were responsible for the observed affinity (Figure 8). The nitrophenyl and chlorophenyl groups and acetamido moiety of compound 3 formed p-p interactions and H-bonds with Ala230, Lys179, and Asp292 residues, respectively. However, the nitrophenylamino group and acetamido moiety of compound 8 presented p-p interactions, H-bonds, and salt-bridge formation with Asp439, Glu234, Arg4, and Lys158 and 276, Phe442, and Ser7 residues, respectively. Nitro substitution on the benzothiazole ring was engaged in p-p interactions with Phe161. Docking scores were -5.55 kcal/mol for compound 3 and -5.33 kcal/mol for compound 8 in the active site of Akt enzyme. In the current work, in vitro and in silico studies were carried out to determine the mechanism of antitumor action of thiadiazole-based anticancer agents. Compounds 3 and 8 induced apoptosis and cell cycle arrest in G1/S and G2/M phases in the C6 cell line through inhibition of Akt activity. 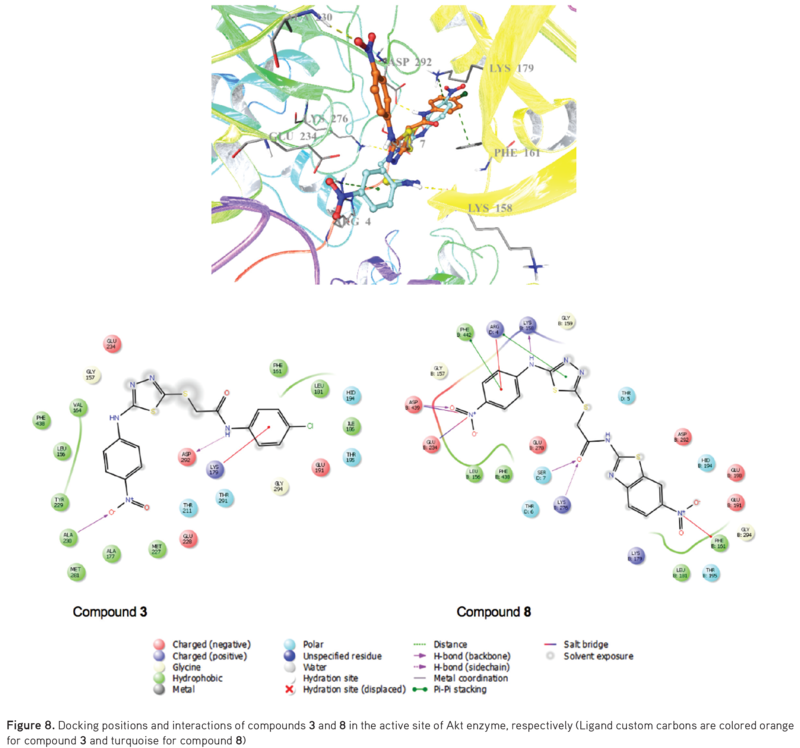 Docking studies also confirmed that compounds 3 and 8 demonstrated high affinity to the active site of Akt enzyme by forming p-p interactions, hydrogen bonds, and salt-bridge formation with appropriate residues. According to in vitro and docking studies, compounds 3 and 8 stand out as promising antiglioma agents for further in vitro and in vivo studies. We thank Anadolu University Medicinal Plants, Drugs and Scientific Research Center for the equipment used in the cytotoxicity assays. Nitulescu GM, Margina D, Juzenas P, Peng Q, Olaru OT, Saloustros E, Fenga C, Spandidos D, Libra M, Tsatsakis AM. Akt inhibitors in cancer treatment: The long journey from drug discovery to clinical use (Review). Int J Oncol. 2016;48:869-885. McDowell KA, Riggins GJ, Gallia GL. Targeting the AKT Pathway in Glioblastoma. Curr Pharm Des. 2011;17:2411-2420. Morrow JK, Du-Cuny L, Chen L, Meuillet EJ, Mash EA, Powis G, Zhang S. Recent Development of Anticancer Therapeutics Targeting Akt. Recent Pat Anti-Cancer Drug Discov. 2011;6:146-159. Cassinelli G, Zuco V, Gatti L, Lanzi C, Zaffaroni N, Colombo D, Perego P. Targeting the Akt Kinase to Modulate Survival, Invasiveness and Drug Resistance of Cancer Cells. Curr Med Chem. 2013;20:1923-1945. Brown JS, Banerji U. Maximising the potential of AKT inhibitors as anti-cancer treatments. Pharmacol Ther. 2017;172:101-115. Roy NK, Bordoloi D, Monisha J, Padmavathi G, Kotoky J, Golla R, Kunnumakkara AB. Specific Targeting of Akt Kinase Isoforms: Taking the Precise Path for Prevention and Treatment of Cancer. Curr Drug Targets. 2017;18:421-435. Jain AK, Sharma S, Vaidya A, Ravichandran V, Agrawal RK. 1,3,4-Thiadiazole and Its Derivatives: A Review on Recent Progress in Biological Activities. Chem Biol Drug Des. 2013;81:557-576. Li Y, Geng J, Liu Y, Yu S, Zhao G. Thiadiazole-A Promising Structure in Medicinal Chemistry. Chem Med Chem. 2013;8:27-41. Hu Y, Li CY, Wang XM, Yang YH, Zhu HL. 1,3,4-Thiadiazole: Synthesis, Reactions, and Applications in Medicinal, Agricultural, and Materials Chemistry. Chem Rev. 2014;114:5572-5610. Matysiak J. Biological and Pharmacological Activities of 1,3,4-Thiadiazole Based Compounds. Mini-Rev Med Chem. 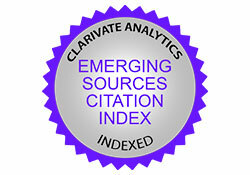 2015;15:762-775. Haider S, Alam MS, Hamid H. 1,3,4-Thiadiazoles: A Potent Multi Targeted Pharmacological Scaffold. Eur J Med Chem. 2015;92:156-177. Aliabadi A. 1,3,4-Thiadiazole Based Anticancer Agents. Anti-Cancer Agents Med Chem. 2016;16:1301-1314. Dawood KM, Farghaly TA. Thiadiazole Inhibitors: A Patent Review. Expert Opin Ther Pat. 2017;27:477-505. Raj V, Rai A, Saha S. Human Cancer Cell Line Based Approach of 1,3,4-thiadiazole and its Fused Ring: A Comprehensive Review. Anti-Cancer Agents Med Chem. 2017;17:500-523. Chou JY, Lai SY, Pan SL, Jow GM, Chern JW, Guh JH. Investigation of anticancer mechanism of thiadiazole-based compound in human non-small cell lung cancer A549 cells. Biochem Pharmacol. 2003;66:115-124. Radi M, Crespan E, Botta G, Falchi F, Maga G, Manetti F, Corradi V, Mancini M, Santucci MA, Schenone S, Botta M. Discovery and SAR of 1,3,4-Thiadiazole Derivatives as Potent Abl Tyrosine Kinase Inhibitors and Cytodifferentiating Agents. Bioorg Med Chem Lett. 2008;18:1207-1211. Sun J, Yang YS, Li W, Zhang YB, Wang XL, Tang JF, Zhu HL. Synthesis, Biological Evaluation and Molecular Docking Studies of 1,3,4-Thiadiazole Derivatives Containing 1,4-Benzodioxan as Potential Antitumor Agents. Bioorg Med Chem Lett. 2011;21:6116-6121. Juszczak M, Matysiak J, Szeliga M, Pożarowski P, Niewiadomy A, Albrecht J, Rzeski W. 2-Amino-1,3,4-thiadiazole Derivative (FABT) Inhibits the Extracellular Signal-Regulated Kinase Pathway and Induces Cell Cycle Arrest in Human Non-Small Lung Carcinoma Cells. Bioorg Med Chem Lett. 2012;22:5466-5469. Guan P, Sun F, Hou X, Wang F, Yi F, Xu W, Fang H. Design, Synthesis and Preliminary Bioactivity Studies of 1,3,4-Thiadiazole Hydroxamic Acid Derivatives as Novel Histone Deacetylase Inhibitors. Bioorg Med Chem. 2012;20:3865-3872. Li YJ, Qin YJ, Makawana JA, Wang YT, Zhang YQ, Zhang YL, Yang MR, Jiang AQ, Zhu HL. Synthesis, Biological Evaluation and Molecular Modeling of 1,3,4-Thiadiazol-2-amide Derivatives as Novel Antitubulin Agents. Bioorg Med Chem. 2014;22:4312-4322. Hosseinzadeh L, Khorand A, Aliabadi A. Discovery of 2-Phenyl-N-(5-(trifluoromethyl)-1,3,4-thiadiazol-2-yl) acetamide Derivatives as Apoptosis Inducers via the Caspase Pathway with Potential Anticancer Activity. Arch Pharm Chem (Weinheim). 2013;346:812-818. Guan P, Wang L, Hou X, Wan Y, Xu W, Tang W, Fang H. Improved Antiproliferative Activity of 1,3,4-Thiadiazole-Containing Histone Deacetylase (HDAC) Inhibitors by Introduction of the Heteroaromatic Surface Recognition Motif. Bioorg Med Chem. 2014;22:5766-5775. Altıntop MD, Can ÖD, Demir Özkay Ü, Kaplancıklı ZA. Synthesis and Evaluation of New 1,3,4-Thiadiazole Derivatives as Antinociceptive Agents. Molecules. 2016:21. Keiser K, Johnson CC, Tipton DA. Cytotoxicity of mineral trioxide aggregate using human periodontal ligament fibroblasts. J Endod. 2000;26:288-291. Altıntop MD, Temel HE, Sever B, Akalın Çiftçi G, Kaplancıklı ZA. Synthesis and Evaluation of New Benzodioxole-Based Thiosemicarbazone Derivatives as Potential Antitumor Agents. Molecules. 2016:21. 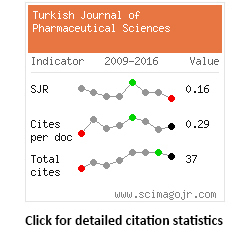 Çiftçi GA, Işcan A, Kutlu M. Escin reduces cell proliferation and induces apoptosis on glioma and lung adenocarcinoma cell lines. Cytotechnology. 2015;67:893-904. Bencsik JR, Xiao D, Blake JF, Kallan NC, Mitchell IS, Spencer KL, Xu R, Gloor SL, Martinson M, Risom T, Woessner RD, Dizon F, Wu WI, Vigers GP, Brandhuber BJ, Skelton NJ, Prior WW, Murray LJ. Discovery of dihydrothieno- and dihydrofuropyrimidines as potent pan Akt inhibitors. Bioorg Med Chem Lett. 2010;20:7037-7041. Porter AG, Jänicke RU. Emerging roles of caspase-3 in apoptosis. Cell Death Differ. 1999;6:99-104. Williams GH, Stoeber K. The cell cycle and cancer. J Pathol. 2012;226:352-364.